Patented Omnipress technology reduces effort needed to staple wherever you press. Patented SuperFlatClinch technology reduces paper stacks by up to 40%. Ergonomic design allows for superior in-hand or desktop performance. A durable plastic body with inner metal construction. 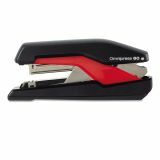 Swingline Omnipress SO60 Heavy-Duty Full Strip Stapler, 60-Sheet Cap, Black/Red - Press anywhere with less force when you use this Rapid Supreme Omnipress SO60 Stapler. 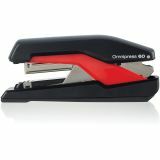 Unlike traditional staplers, patented Omnipress technology allows you to staple by pressing anywhere on the stapler body. With patented SuperFlatClinch technology, paper stacks are 40 percent flatter. 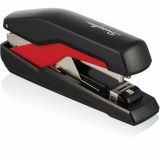 Compared to other press-less staplers, the ergonomic design allows superior in-hand or desktop use. 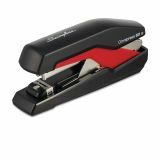 Stapler fastens up to 60 sheets with a 5/16" staple. It includes a starter pack of Omnipress staples. For best results, use Swingline S.F. 4 staples. Starter set of staples is included.